Sanjay Mohan Gupta | I.K International Publishing House Pvt. Ltd.
Sanjay Mohan Gupta did his Masters in Biotechnology from School of Biotechnology, Devi Ahilya University, Indore in 1999 and was ranked second in the university. In his Master’s dissertation, he worked on enzyme immobilization technology and developed an indigenous bed-reactor using brick dust immobilized CM-Cellulase enzyme isolated from Cowpea (Vigna sinensis L.). He did his PhD degree in Biochemistry in 2007 from University of Lucknow, Lucknow and worked on genetic manipulation of banana fruit ripening. He has isolated and characterized ethylene regulated and ripening related 27 novel genes from banana pulp tissue by differential-display (DDRT-PCR) method and also studied ethylene biosynthesis, respiratory climacteric and activities of the various ripening related enzymes during ripening in banana. In his professional career, he has been working as senior scientist at Defence Institute of Bio-energy Research (DIBER) since 2004. He is involved in research project funded by DRDO and investigating the isolation and characterization of cold tolerant genes from the high altitude indigenous cold tolerant Seabuckthorn (Hippophae salicifolia L.) plant for genetic transformation of the vegetable crops. He has published 20 research papers, semi scientific papers in leading national and international journals. 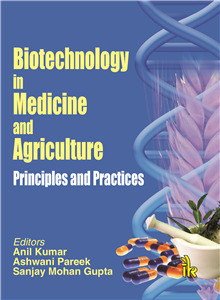 He is a coauthor of two books in the field biotechnology. He is also a member of the Indian Science Congress, professional society and other various scientific committees.